Finally docked in Miami, the crew and volunteers had a chance to relax and enjoy a little Florida sunshine. It felt wonderful being in shorts and a t-shirt and not being tossed back and forth from the storm. It had been a long cold month getting to this point. From the time we first heard of the Haiti earthquake, we had all been on the go. It began with making endless calls and soliciting for aid. 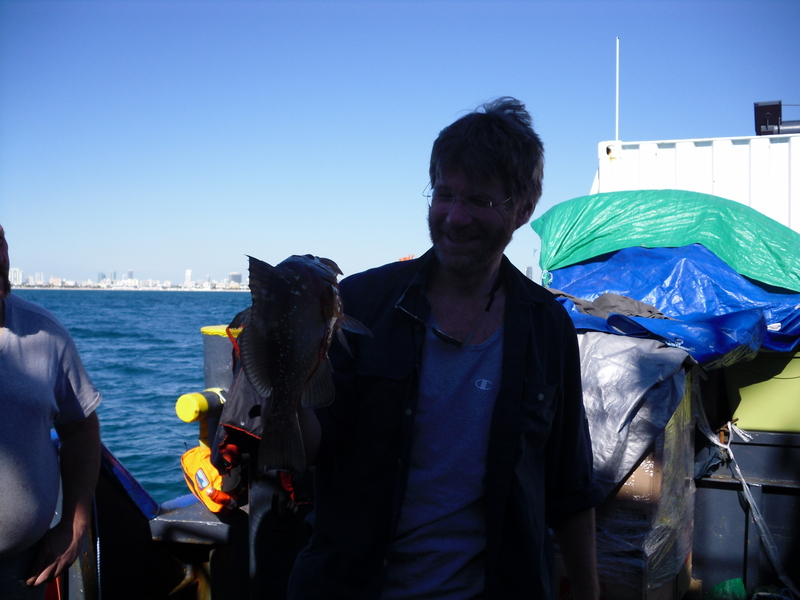 Then it was a couple of weeks loading supplies and preparing the ship in zero degree weather. Next it was two horrific days stuck in a nor’easter in Delaware Bay. And finally, the two calmer days steaming into Miami to load additional supplies before heading to Haiti. 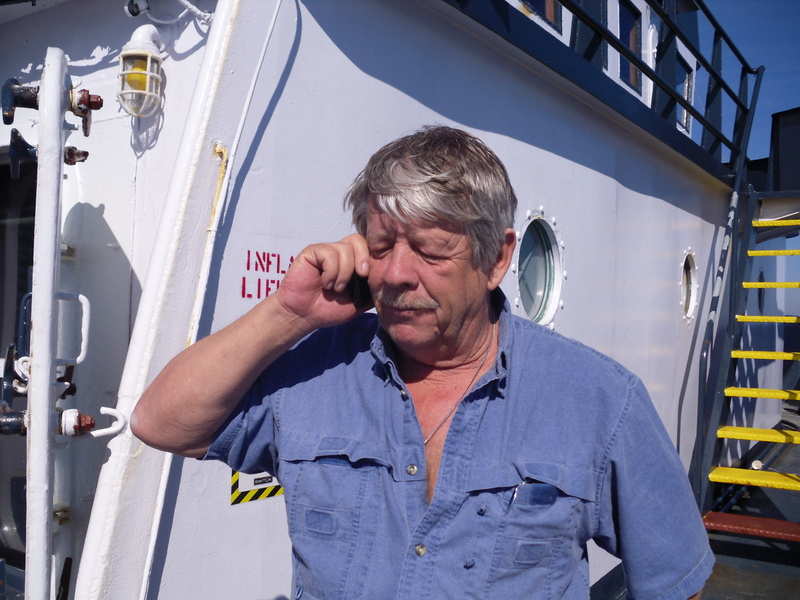 When Greg informed us that the Coast Guard and US Customs were requiring the M/V Sea Hunter to have a licensed captain, declare all that was aboard and pay a duty tax, it was disheartening, but we thought of it as just another bump in the road. We had come this far and we had faith that Greg would work everything out. Oh, and let’s not forget, we had Bill Nemitz, a columnist from Maine. He was writing daily articles about our venture in our local newspaper, the Portland Press Herald. With so many people cheering us on, I had no doubt we would soon be loading and on our way. (Unfortunately, this wouldn’t be the case). Columnist Bill Nemitz, taking a break and doing some fishing. First things first, we had only a limited amount of time to load the ten large containers and the portable water desalinator aboard the ship. The dock we were at could only accommodate us for a short time before we had to move. Thankfully the Sea Hunter was equipped with a 40 ton crane aboard to accomplish this huge task. We all got to work reloading the boxes that were soaked from being exposed in the storms. Once the containers were on board, we moved the boxes inside the containers. While this was happening, Greg was meeting with the various officials from both the Coast Guard and US Customs department. He was also in contact with Maine officials who were willing to help us get clearance and finish our trip. Chellie Pingree (a Maine Congresswoman) and her staff were instrumental in helping this along. They got in contact with a retired Maine Maritime captain who agreed to fly to Miami and captain the ship to Haiti. This was good news to us all. We hadn’t come this far to be stopped. Though we were living this turmoil day in and day out, we all looked forward to reading Bill’s column online. It was interesting reading it from an outsiders prospective. However, the part that bothered me and the crew was the few negative comments. Most people were cheering for us and couldn’t understand why our own government would be holding us up with so much red tape. Then we had the few that criticized us for not knowing what was required. Some were even hoping we would fail. Though I will admit it hurt, we mostly ignored the naysayers. We concentrated on what was required of us, getting it done and completely our humanitarian trip. Though it had been almost a month since the earthquake, some thought it was too late, as the aid was needed much sooner. However, the majority of our supplies were going to an orphanage in Les Cayes, named Hope Village. It was run by a Roman Catholic priest, Rev. Marc Boisvert, who was originally from Maine. He founded Hope Village eight years prior and he and a small staff had been running it since the earthquake. He went from caring for 600 orphaned Haitians to well over 700. They never receive any money or help from the Haitian government, it was all run through donations. They were desperate and could use everything we had aboard. Greg had spoken with them a few times while in Miami and they were praying for the M/V Sea Hunter’s safe journey to Haiti. With the many roadblocks we kept encountering, we knew we had to do whatever it took to get there. The children of Hope Village needed us and that helped to keep us going.